I woke up this morning to a text from my mom. It was a screenshot of a post that I put on her wall in 2009. I was about to meet with one of my writing professors who negatively critiqued a piece that I’d poured my heart into. In hindsight, it was all constructive criticism, but hey, some lessons can only be learned with time. My apologies Professor Jackass. 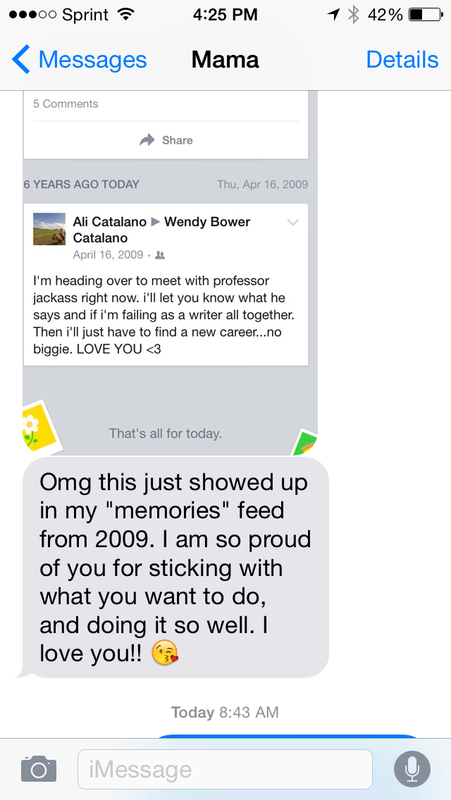 My mom went on to tell me how proud she is of me for sticking with what I want to do. Which was simultaneously wonderful and painful to hear. We all have struggles, and right now is just one of those times for me. I was recently taken off salary and made a part time consultant – not because of work ethic or performance, but due to finances and demand. And I’ve accepted that. Hell, I even saw it coming. My boss and I have a fantastic relationship – one that most young professionals dream of. She is laid back, intelligent, trusting, and an incredible role model. And I respect her endlessly. I’m trying to stay positive in my journey and remember that there are always going to be highs and lows. And in my experience, the lows are often the times of invaluable reflection and learning and growth. I’m not unemployed, I wasn’t laid off, and I have SO much to be thankful for. So please, spare me the “first world problems” comments – I am so thankful for what I have. But things are a little uncertain right now. And with uncertainty comes fear. I read somewhere recently that fear often means something great is about to happen. And I know first hand that statement is true. I was petrified starting this blog. I was petrified going to my first yoga class. I was petrified about moving to Hawaii. And I am currently petrified of publishing this blog post. Fear generally means you’re stepping outside of your comfort zone. I’ve experienced so many wonderful, life-changing things despite fear — but I’m still so freakin’ scared. Scared of failing. Scared of falling. Scared of having to ask for help. I want so badly to pay off my student loans, and be able to say I did it without selling myself short. Or selling drugs. Kidding. I want to say I did it without sacrificing my passions and happiness and fulfillment. But here I am, just getting by. It’s hard to hear that someone you love is proud of you when you don’t feel proud of yourself, or when you don’t feel like you are enough. But what will it take for me to feel proud? Will it be trading in what I’ve wanted for so long for a pantsuit in a cubicle, just to pay off my student loans in a few years? Then what? Just because my student loan accounts are empty doesn’t mean my heart is full. I’ll be proud when I know I’ve given it everything. I’ll be proud when I know I made it on my own terms. So right now I need to embrace the fear. Embrace that I have it in me to stick with it when things are hard and scary and uncertain. Embrace this time of reflection, learning, and growth and make it mine. Make it worth it. Embrace the fear. Try something new. Book the ticket. Hit publish. Be great.